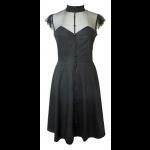 A stunning black strapless gothic dress by Punk Rave absolutely dripping with incredible detail. It's made from top quality black satin and covered entirely with fine black net. The bust area has pleated sides and a black lace insert and comes with a bejeweled crown attached brooch. The sides and back of the dress have adjustable ribbon corset lacing to ensure a custom fit. The net hem is edged with gorgeous pleated and beaded lace, whilst the lower hem has pleated satin and ruffled edging. The back has a small rouched panel again, to ensure a snug fit. The dress also has loops inside the bodice area if you wish to add your own straps. Concealed side zip fastening. 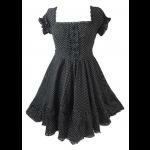 The dress comes with a beaded lace choker collar with a black resin rose pendant. Totally divine. Bust: 32" Waist: 26" Length: 28"
Bust: 34" Waist: 28" Length: 28"
Bust: 36" Waist: 30" Length: 29"
Bust: 38" Waist: 32" Length: 29"